Ok, so if you’ve been living under a rock this week, you’d think that the people of Egypt are hijacking our 4th of July celebration! The truth is, even if you haven’t been living under a rock for the past week, you may come to the same conclusion. 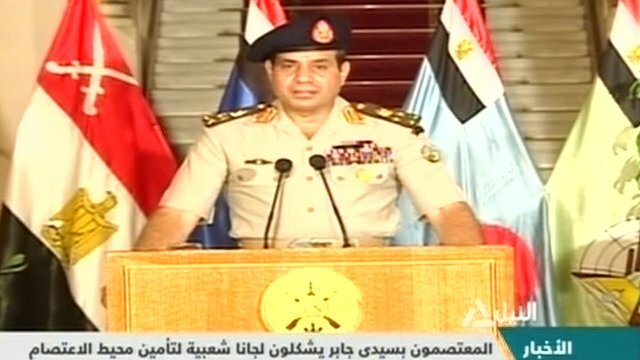 Egyptian military (SCAF) chief Gen. Abdel Fattah al-Sisi (pictured above), announced on July 3 that the country’s president, Mohammed Morsi, had been removed from office in the wake of public, but largely popular, unrest in the streets. 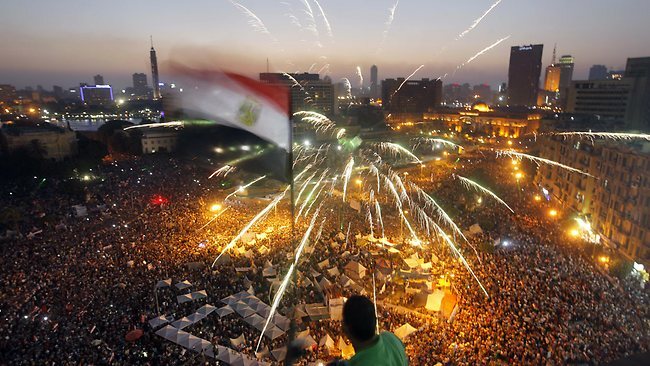 The number of Egyptians protesting, some 33,000,000, was the largest number of protesters in a political event in the history of mankind (that I know of). [The now] Ex-President Mohamed Morsi was a political unknown a year ago; he was not a great statesman. But in Egypt’s first popular presidential election, Morsi was the torch bearer for the Muslim Brotherhood and won 51.7% of the popular vote. The organization, which was founded in Egypt more than 80 years ago, had been banned for decades, most notably suppressed under the rule of Hosni Mubarak, has dreamt of ruling Egypt and the rest of the Islamic world. In the eyes of many that day was a great day for Egyptians; the people voted, and a party that was persecuted for most of its existence was actually elected and trusted by a majority to govern the country and bring the people’s demands for bread, freedom and social justice to the forefront. And it’s not like the SCAF, who were skeptical of the democratic alternative to Mubarak, intervened and didn’t give the Brotherhood a chance to rule. The SCAF gave Morsi and the Brotherhood a chance to rule; in fact they gave the Brotherhood a whole year to rule and the party publicly failed on its own merits over the course of that year. Perhaps the military chose not to intervene when the Brotherhood did win so as to prove to everyone that they were not fit to rule Egypt (that’s speculation of course). 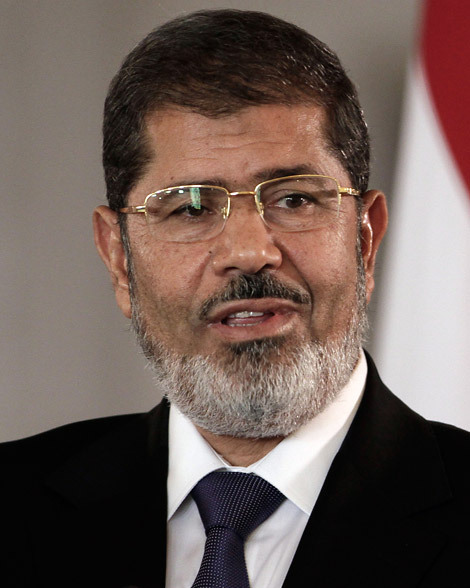 Mohammed Morsi, the man of the hour. The Brotherhood was elected with a slim majority (51.7% means that 48.3% voted for somebody else) and in the technical sense of the phrase, they “totally blew it.” Morsi and the Brotherhood assumed power and adopted a hardliner, exclusive approach to governing. They ignored a crippling economy, failed to ensure basic security and protection of minority groups, and refused to include other parties (even other Islamist groups) in a coalition government that we in the United States and other Westernized democracies, perhaps take for granted. In the end, the Muslim brotherhood led Egypt down the path of Islamic despotism and economic decline. But I guess since the Brotherhood took all the power, they can take all the blame. 1) Don’t think just because the Muslim Brotherhood was booted out that all is ok now with them. Expect the Brotherhood to keep resisting and push back against this move by the military; they will not forget. 2) The people protesting in the streets were all united in that they wanted Morsi and the Brotherhood out, but that’s about all they really agree on. The future will be a struggle of their competing interests. Unfortunately for the politics of the Middle East, most countries have a “winner-take-all” policy. 3) For decades, since the Cold War to today, the military has essentially ruled, approving and backing an individual or a party. This is primarily because no military wants to be involved in the day-to-day affairs of running a country. 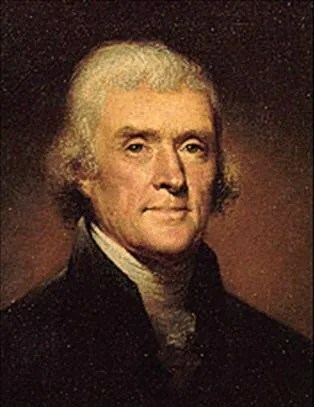 The military has and will remain the primary source of power in the country, as with many countries, and will throw its weight behind any party or coalition that will see to managing the political economy and as such, limiting unrest. I call upon the Egyptian people to prove me wrong. I would wholeheartedly welcome that. I sincerely hope that this coup is more akin to the one we witnessed in Portugal in 1974 than the one in Algeria in the 1990s. But as with all things though, time will tell. Baltimore’s Unrest: A Manufacturing Crisis? From “¡Viva la Revolución!” to “¡Viva la Normalización!”?